Neal's Blog: Back to climbing after a lay-off - gulp! I'm sure one or two people are wondering, how's the climbing going? 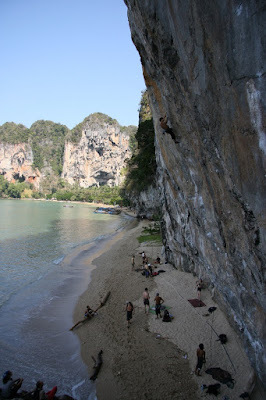 As ever, the climbing here in Ton Sai is awesome: super powerful, and always humbling. The grades are as always, emmmm, amusing - meaning that you need an open mind on most routes. Just because you can climb that grade doesn't always mean it'll be very easy or very hard! Under and over-grading seems to be ripe here, although the new guidebook seems to be rectify some of the old queries. As a nice compliment, it's nice to see that one of the routes I climbed has been re-graded to 8a, and a route I down-graded from 7c+ after flashing it has been confirmed at the grade. Jeez, I must have been climbing well last year - nice to see proof that my training paid off. Will bash out an email to ya soon!